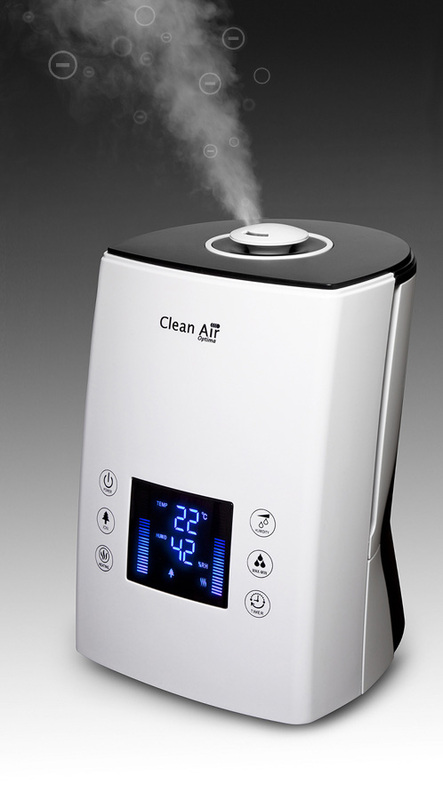 2in1: humidifying and air cleaning! Doctors’ advice is that optimal air humidity should be between 40% to 60% relative humidity. In this range humans experience humidity as optimal and pleasant. The degree of humidity is then ideal for humans and animals and at the same time furniture, wooden floors, music instruments, antiques, plants and other valuable objects are protected against drying-out. Ultrasonic air humidifier CA-606 with ionizer for a healthy indoor atmosphere! 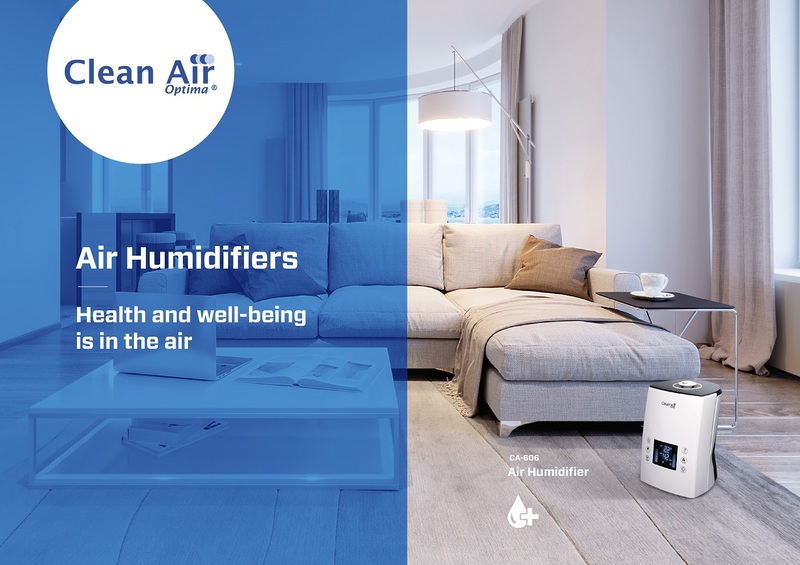 This efficient humidifier with ionizer and hot and cold water diffuser regulates automatically the ideal humidity and improves the quality of life in rooms up to 65m²/160m³ where people live, sleep, work or rest. Top design for each interior. The first-class ultrasonic air humidifier CA-606 with ionizer proves with its lifestyle design, beautiful forms, high efficiency and functionality that “beauty enriches life”. • No need to replace the filters! 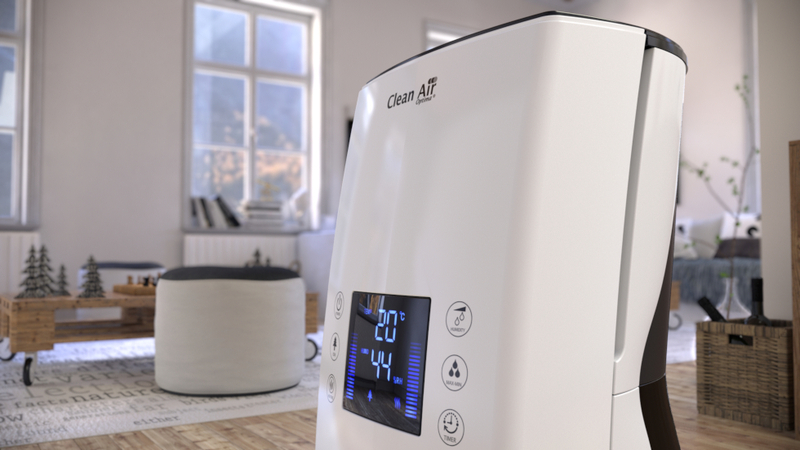 Ultrasound technology integrated into the modern air humidifier CA-606 by Clean Air Optima belongs to the most effective methods of automatic air humidification for interiors. Ultrasonic vaporization is created by a small plate vibrating at a high frequency (seductor) in the water tank. The seductor produces micro-fine warm and cold steam that is released back into ambient air via the fan, via the 360° turnable vaporizer and the double outlet and then evaporates. 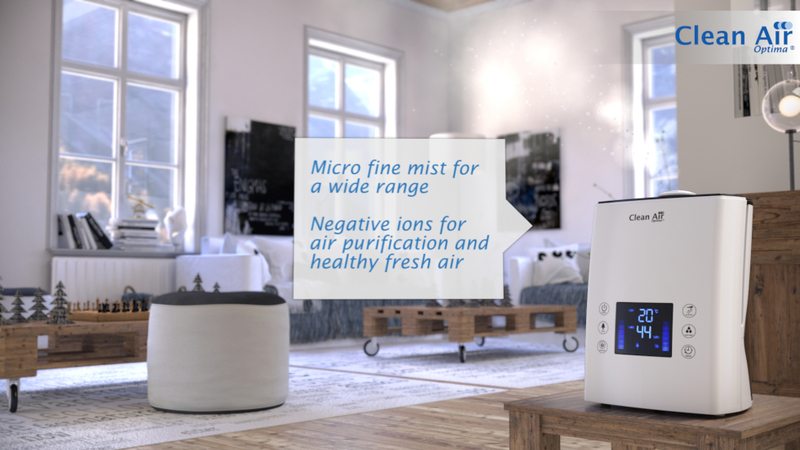 The ultrasonic air humidifier with ionizer CA-606 is equipped with an integrated ionizer that produces negative ions in order to clean ambient air. 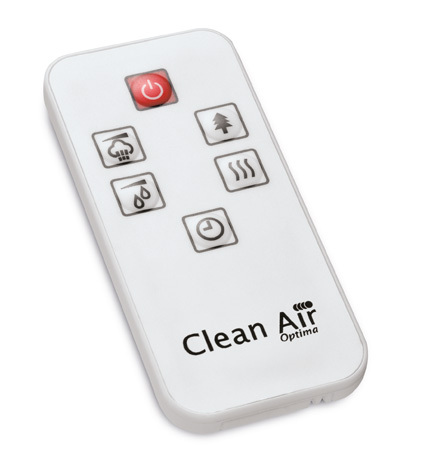 Moreover it enriches poor quality air with negative ions and thereby improves air quality. Negative ions attach themselves to dust particles, microorganisms and other unwanted particles and connect them to each other. The particles hence get heavier and descend to the ground or are filtered by the ionizer. Negative ions support the buildup of energy reserves, as well as the metabolism, the blood circulation and the immune system. Moreover it can allay problems with allergies, asthma and headaches. Healing processes are accelerated and stress and sleep disorders are reduced. Especially during the heating period, relative humidity in living and working spaces drops beneath the advised 40% level. In winter times rooms that are heated are full of dry air. The more the ambient air is cold, the less humidity can be absorbed. In summer times air-conditioning also leads to dry air. Low air humidity has negative consequences for the well-being of humans and animals. 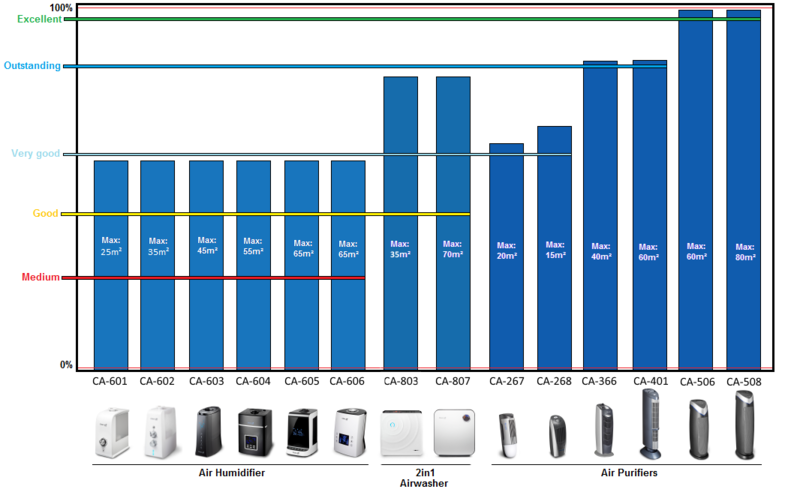 If exposed too long to dry air conditions sicknesses and respiratory diseases may follow. Furniture, wooden floors, antiques and plants also suffer from low humidity. During dry times many allergens like dust mites swirl through the rooms. Itchy eyes, irritated respiratory ducts and dry skin are the negative consequences of dry air. 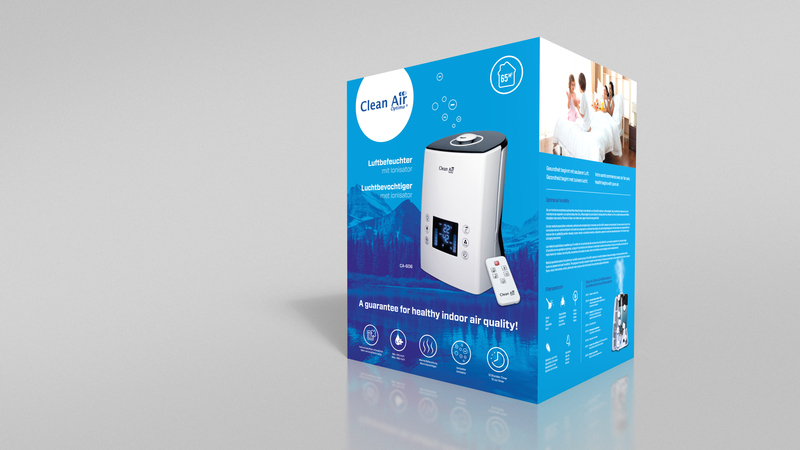 The ultrasonic air humidifier with ionizer by Clean Air Optima is suited for rooms up to 65m²/160m³ and increases your well-being. Dry skin is protected and provided with enough humidity. Sufficient humidity reduces dust swirling. 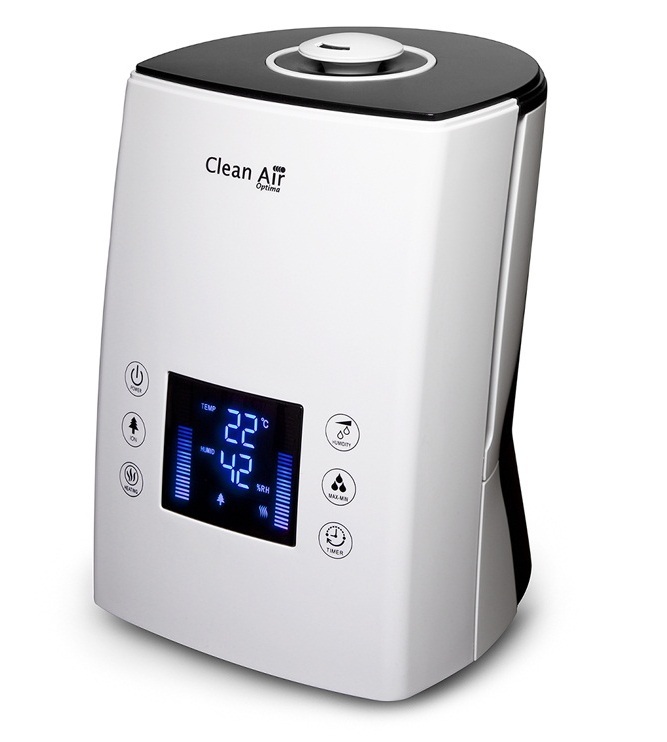 The integrated ionizer purifies the air and hence improves air quality. 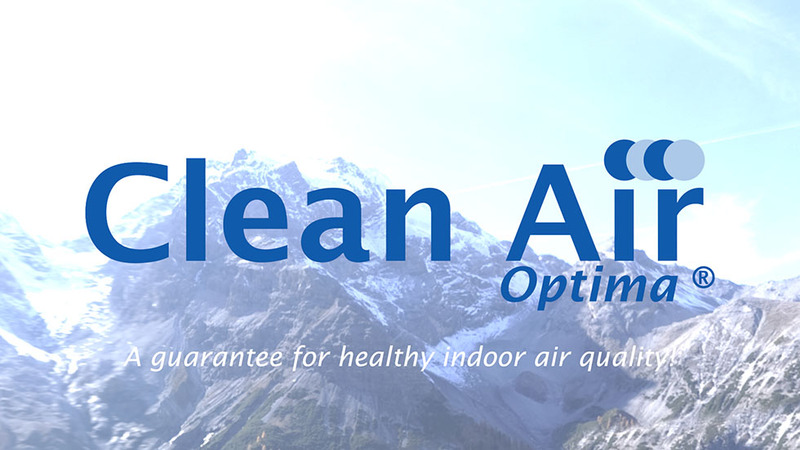 Persons suffering from allergies and skin problems have fewer troubles thanks to optimal humidity and healthy air. They can sleep better and their quality of life improves. Correct humidity and healthy air in the living room and in the bedroom protect babies and children from dry and itchy skin, cracked lips, getting a sore throat and moreover reduce the risk of being subject to house mite allergies. 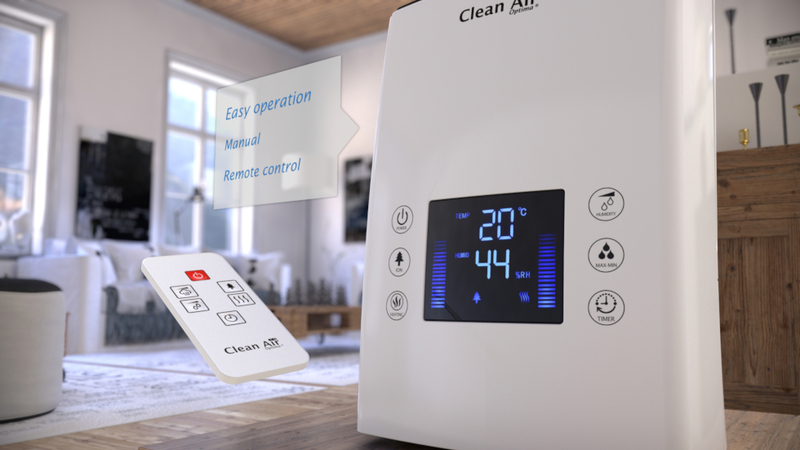 The ultrasonic air humidifier with ionizer CA-606 regulates automatically the right humidity and improves air quality indoors, reduces health problems caused by dry air und protects valuable items from drying-out. Efficient ultrasonic humidification technology with warm and cold water vaporization, air purification through the integrated ionizer, silent operating and elegant design make the unique ultrasonic air humidifier with ionizer CA-606 the perfect device for all interiors: living room, kitchen, bedroom, fitness room, office, exhibition room, conference rooms, treatment rooms, doctor’s practice, health care institutions, nurseries, class rooms, training rooms, hotels, restaurants, spa areas, animal shelters etc. exhibition rooms and doctor’s practices etc. 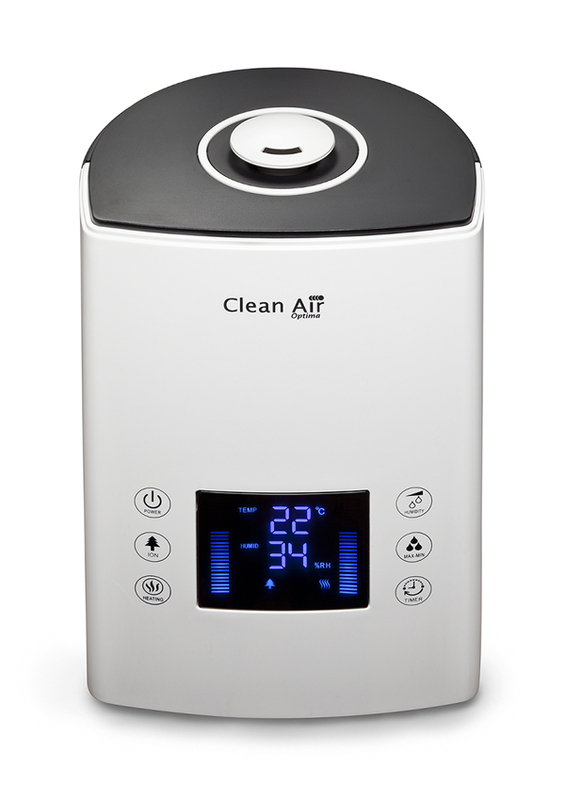 The Clean Air Optima ultrasonic air humidifier CA-606 with ionizer works without chemical additives. Harmful particles, bacteria and virus in the water are destroyed to a big extent by ultrasound and high frequency oscillations. 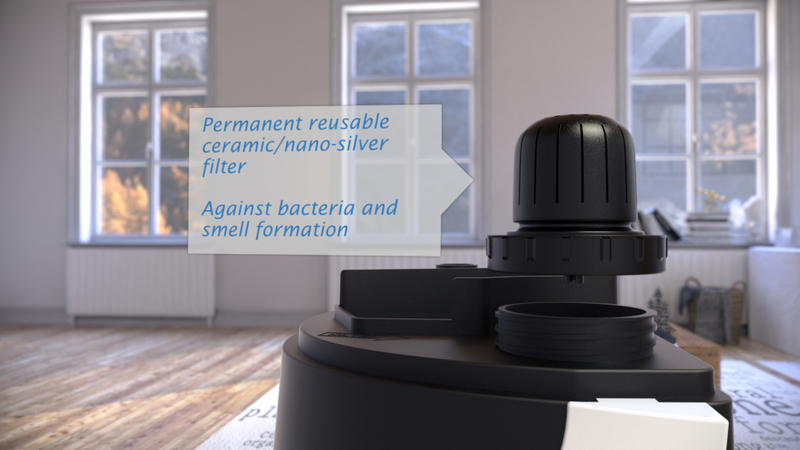 The material of the air humidifier that gets into contact with water is treated with nano-silver which counters bacteria and smell formation. 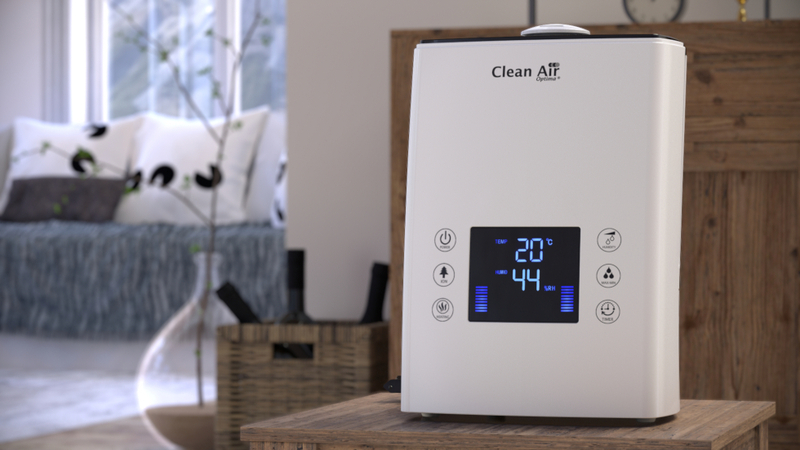 Indoor air quality is improved through air purification with the ionizer. The high-class Clean Air Optima ultrasonic air humidifier CA-606 with ionizer is equipped with a remote control and can also be operated through keys on the device. The programs can easily be read on the big lit display. 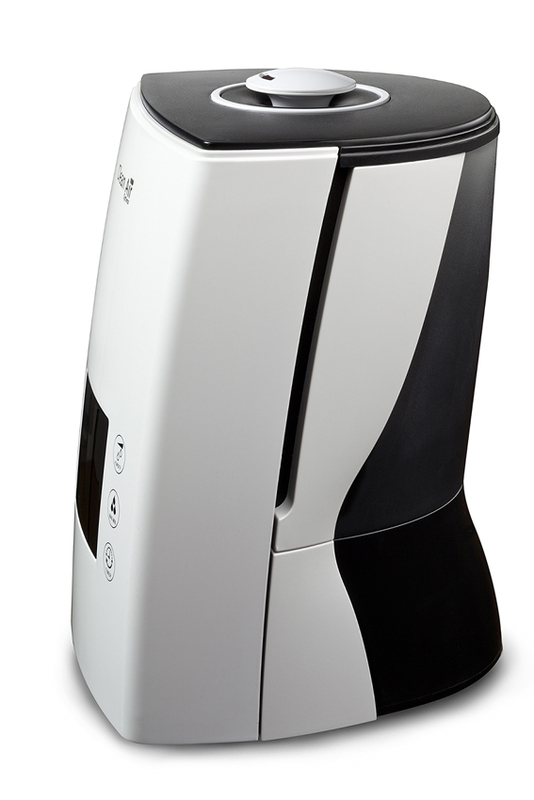 The integrated security system with light and acoustic signal automatically turns off the humidifier if there is not enough water in the tank. 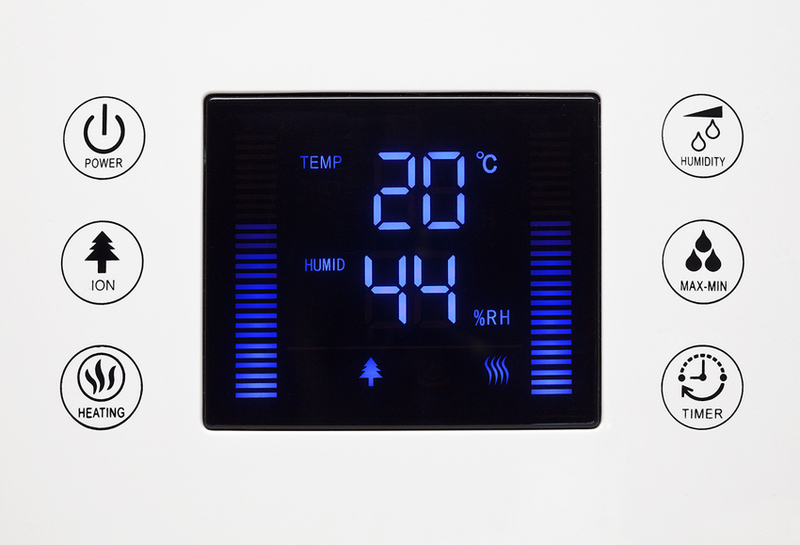 Humidity is regulated automatically through the hygrostat and can be freely tuned between 45 and 90%. 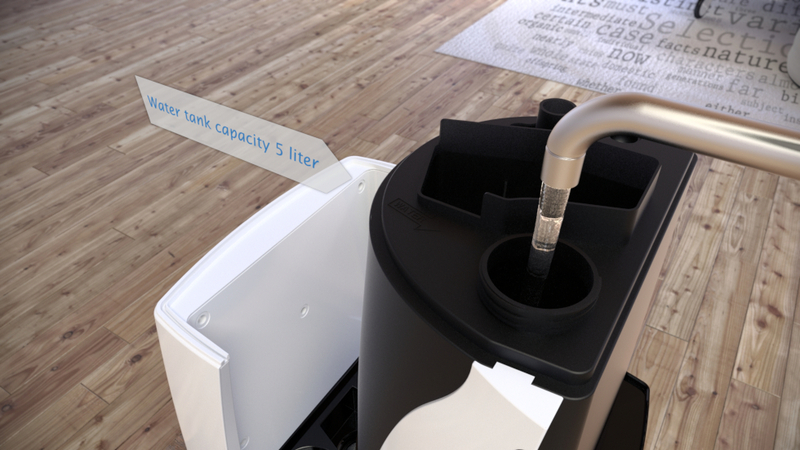 The nano-ceramic filter decalcifies and softens the water additionally. Thanks to this filter, there is no need for expensive replacement filters. 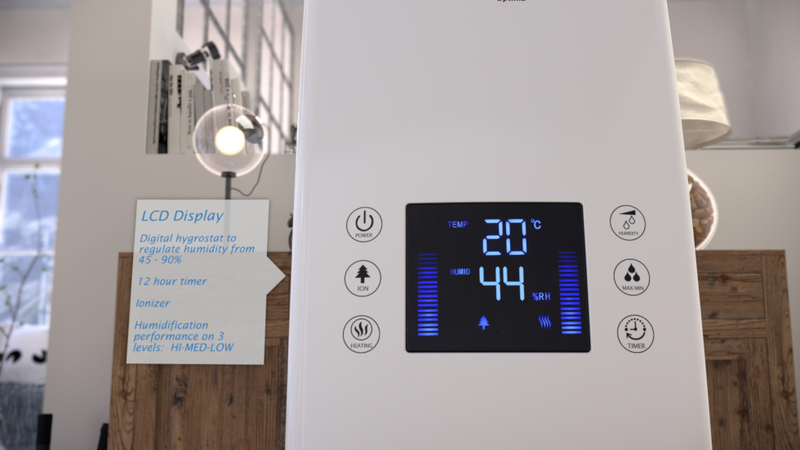 Moreover the device is very energy-efficient. 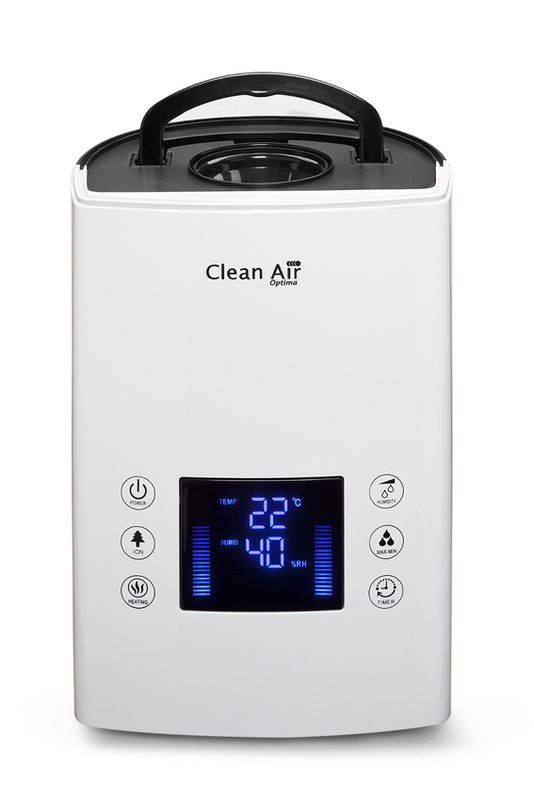 The ultrasonic air humidifier CA-606 by Clean Air Optima with permanent filter is ideal for private and professional use. • Reduces dust, fine dust, allergens as for example pollen and house dust mites indoors! • Prevents itchy eyes, dry mucosa, sore throats and dry skin! • Reduces allergy symptoms during hay fever season! • Protects wooden floors, furniture, valuable items and interior! • Warning and automatic turn off when tank is empty! • No need to replace filters!! • No replacement of filters needed! • Use cold or distilled water. • Clean once a month the ultrasonic vibration element, the water tank and the recipient. • Add fresh water regularly. • If the device is turned off for longer, clean thoroughly and let all the pieces dry well. The ultrasonic system with high frequency oscillations destroys most of the bacteria and virus. 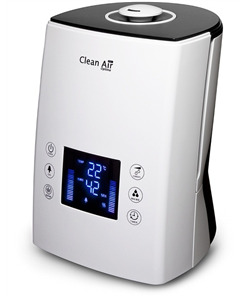 Preheating of water eliminates additional bacteria and virus. Not suited for the usage of essential oils. Attention! Do not press too hard on the membrane in order to avoid damages. Never use sharp or hard tool to clean the device. 3. Clean the water reservoir with clean water. reservoir because otherwise the device can be damaged! 1. Remove the filter from the water tank. 2. Fill a glass up to the half with vinegar. Put the filter into the glass with vinegar for 10 minutes. 3. Remove the filter from the glass and shake the filter several times. 4. Clean the filter with water and put it back into the device. Working very well and easy to use. Na een behoorlijk aantal jaren 24/7 trouw zijn dienst gedaan te hebben, was de oude CA-606 aan zijn einde gekomen. In verband met meteen merkbare droge ogen, hebben wij onmiddelijk weer een nieuwe besteld. Deze was na enkele dagen in huis en deze is meteen weer aangezet. Het vertrouwde pluimpje is er weer en we kunnen weer flink wat jaren vooruit.